I decided to die the year the Rosenbergs were executed. My mother would be the instrument of my demise. It would be my plan, but she’d be the one to actually extinguish my life. The point was to die in such a manner that she’d be forced to take full responsibility for the tragic end to my brief but promising nine years of existence. That’s all I wanted. I arrived at the ultimate solution only after a series of less-final measures proved ineffective in convincing her to compromise with me. Most of my maneuvers were pretty ingenious because they had to be executed with neither begging nor whining, two infractions my mother would not countenance in her children. In her lexicon, begging consisted of making the same request twice, and whining, like complaining, was an activity indulged in only by the weak. A rolling of the eyes, if one ever dared such a thing, could result in a slap. That left few possibilities for registering disagreement, so I was sometimes forced to resort to more indirect modes of expression. It was the 1950s, the era of McCarthyism and the Red Scare. My parents, public members of the Communist Party, had moved from Manhattan to Croton-on-Hudson, a Catholic, Republican, blue-collar town that held within it the remnants of a small Socialist, artistic enclave. My father, born in a shipbuilding town near Odessa in the Ukraine and brought to the U.S. by his parents as a young child, had been an editor of the CP cultural magazine New Masses and was now foreign editor of the CP daily newspaper the Daily Worker. My mother, who was born in the Bronx and had been a teenage labor organizer, was the daughter of Ukrainian political prisoners who fled to the U.S. before the revolution. She was still a CP organizer, as well as the family breadwinner, since my father’s important work did not include a living salary. In fact, his Party responsibilities meant that he was frequently out of the country for lengthy periods of time covering wars and other political and cultural events, so it was left to my mother to run the house, raise the children, earn a living, and still function as a party activist. There were many conflicts between my mother and me. Minor ones were my not wanting to wear clothes hand-made by her, not wanting to practice the piano, not wanting to go to bed hours before everyone else, not wanting to take bag lunches to school when everybody else got to buy cafeteria food, and not wanting to be forced to play with children I didn’t like even if their parents were Comrades. That was all small stuff. My problem was that I couldn’t abide being left alone at night. Because my father was often traveling, and my brother and sister were away at college, when my mother’s frequent CP meetings and other political organizing activities took her out of the house after dark, it meant leaving me by myself. Our house was practically in the woods, on a dead-end street, and surrounded at night by a hostile semi-circle of unseen but seeing eyes: the FBI men watching, waiting, listening in cars camouflaged by hedges, bushes, and low-hanging branches either on the road or in neighbors’ driveways. They tapped our phone, opened our mail, and kept a constant watch on our house. I always knew where they lurked by their lit cigarettes that arced like fireflies through the dark. Whoosh. The air swirled behind her with the spicy red scent of Cinnabar that also emerged from her dresser drawers and the closet where her dresses hung. Footsteps moved away from the house, gravel crunched, the car started, taillights disappeared up the road, and she was gone. Before it got to this point, however, I would have pulled out all the stops. On more than one occasion I opened the oven door and stuck my body inside almost up to my waist, although I had no idea how to turn on the gas. “Stop being such a television dolly,” was my mother’s reaction. After she’d left, I’d sometimes call Ruth, her closest friend from childhood. Ruth lived in Manhattan, and asked if I could run away to her house. “Only with your mother’s permission,” she’d answer. Nobody willingly crossed my mother. I tried another tack, this time with my own best friend. “Why can’t Laura sleep over?” Her parents were also CP members. I didn’t need an adult to stay with me; I just needed somebody. “Not on a school night.” Another rule of hers. “But you can sleep in my bed so you and she can talk on the phone. I’ll put you in your bed when I get home. Just don’t talk too long.” That was as much of a concession as I ever got, but for the moment it sufficed. I’d go upstairs, put on my nightgown, and scrunch down in my parents’ bed, and Laura and I would talk for hours. If people on the party line needed to use the phone we’d hang up and call each other back when they were finished. If my mother had to go out on a Friday or Saturday night, Laura was allowed to sleep over. She didn’t mind going downstairs where the prying eyes could see in, so she would bring us glasses of water or something to eat while I remained upstairs safe from view behind the bedroom curtains. Normally, I was the braver, more physically daring, and protective of the two of us, so it was quite a reversal when I became immobilized by fear and she became the rescuer. “Boy,” she’d marvel, regarding me gravely with her slanted green eyes, “most kids are afraid of robbers, kidnappers, or the boogeyman; you’re the only one I know so afraid of the FBI.” I didn’t know how to tell her that was exactly what the FBI was to me: robbers, kidnappers, and boogeymen. I doubled down on my mother, embarking on a program of kamikaze raids to register my distress. My insurrectional activity had to be subtle and indirect enough so as not to get me into trouble, but eloquent enough so that she got the point. On one such occasion I opened the refrigerator to see if I could draw inspiration from its contents. We had very little money and my mother was a master of economy. I knew exactly which items were for everyday eating and which were special occasion foods and therefore restricted. When we had guests, my mother made a stroganoff prepared with two extravagant items: sour cream and beef. To accompany the stroganoff she’d make brown rice in the pockmarked rice pot her mother had brought from Odessa. Then she’d remove the rice and mold it into several shoebox-sized rectangles that she wrapped in newsprint as precisely as she would a gift in colored tissue paper. It was my job to transport these packages into the living room and arrange them on the hearth so they’d be kept warm by the fire in the fireplace. She needed the other burners for the rest of the meal, and the oven for the lemon meringue pie she baked for dessert. This night, standing tentatively on one bare foot, my eyes ran horizontally across the refrigerator shelves. Milk, eggs, farmers’ cheese, butter, wheat germ, celery, carrots, radishes, lettuce, spinach, broccoli, a whole chicken in a plastic bag stared back. Suddenly a red and white wax container stopped me. Sour cream. This was it. I reached into the refrigerator, grabbed the container, strode into the bathroom and closed the door. I glanced at myself in the mirror and was surprised by the sight of my swollen face and red eyes. I hadn’t realized I’d been crying. I needed to comfort my face. Reaching into the cabinet next to the sink I pulled out my sister’s plastic bag of cotton. I removed the top of the sour cream container, pulled a piece of cotton from the bag, and dipped it into the white, pristine surface. Just doing that felt good. I dabbed it around my eyes, across my forehead, over my cheeks. The cooling creaminess was perfect. I continued until my lips looked thick and cherry red, and my eyebrows were two dark slashes across the clown-like mask of whiteness that covered my face. My skin tingled like a fizzy liquid; I wanted the rest of my body to feel that way, too. Very carefully, so as not to brush it against my face, I pulled off my nightgown. Using piece after piece of cotton, I dabbed the sour cream all over my body like a doctor staunching the flow of blood from multiple wounds. Each comforting dab was for a different night my mother had walked out that door. I put it on the arches of my feet, under my arms, between my legs and across my buttocks. I used up all the sour cream and, when the container was empty, stuffed all the soggy, unappetizing wads of cotton into it, put the cover back on as tightly as I could and ran naked into the kitchen to bury it at the bottom of the garbage. Grabbing my nightgown, I ran up the narrow spiral staircase to the attic my mother had converted into four small bedrooms and a tiny bath. Hanging my nightgown on the hook behind the door, I jumped into a stall the size of an upright coffin, showered, and then watched as white foam pooled around my feet and drained. I dried myself off, put my nightgown back on and got into bed feeling a sense of accomplishment. The next morning I had no idea what to expect when I came down for breakfast. Nothing varied in the usual get ready to go to school and leave for work routine. My mother was inscrutable. It tormented me, and I longed to ask her if she’d noticed anything out of the ordinary. But I couldn’t. She already called me the world’s worst liar because, after telling an untruth, I’d never know if I’d gotten away with it, and finally, unable to endure the doubt, I’d cave in. “Do you believe me?” I’d ask. This time neither of us said anything. Although my mother didn’t acknowledge or punish me for my insubordination, she still refused to let anybody stay with me while she was out. The incident did have a significant effect on me, however: the realization that I wasn’t entirely powerless, that I could exact my own brand of retribution as creatively as I dared. Julius and Ethel Rosenberg were not executed on a school night. It took place on Friday, June 19, 1953. For some reason, perhaps the turmoil of the situation, no sleepover was on my schedule. My parents went to the city to participate in an all-night vigil in the hopes that there would be a last-minute reprieve. Maybe I was ashamed, under the circumstances, to ask for someone to keep me company. Everyone had been talking about this for weeks and working on the case for months, even years. Given the larger context, my fears might have seemed petty to me, or maybe I lost sight of them in the larger drama. I think all of us red diaper babies (as children of Communists were called) held an unarticulated fear that Julius and Ethel could be any of our parents and that we all carried within us something of their sons. The leaflets and newspaper photographs of the Rosenbergs were all too familiar: Julius seated and looking old-world professorial, Ethel standing beside and slightly behind him with her sad, dark eyes looking at the camera as though she already knew their fate. The Rosenbergs were in Sing Sing Prison in Ossining, New York, one town south of us. The prison was clearly visible from my bedroom window, a white smudge that jutted from the eastern bank of the Hudson River. One Sunday afternoon, Manny Bloch, the Rosenbergs’ lawyer, brought the Rosenbergs’ sons over to our house after a visit with their parents. Michael resembled his father, while Robbie, a little younger than me, had shiny dark hair, the broad, kind face of his mother, and an expression of childlike innocence. While the grown-ups conferred, we three children sat on the living room floor. I looked at the two boys whose parents would soon be killed. I could barely speak; my throat burned from holding back my tears as I watched the sweet, subdued city boys, who were enthralled by our gentle dog. They wanted her to take a nap, and although she was bigger and heavier than the two of them put together, they pulled and tugged at her until she was laid out across their laps on her back, paws up in the air as she good-naturedly permitted their positioning. Once they were satisfied with her placement, the boys began to sing her lullabies. I’d heard that Ethel had a beautiful singing voice, and I wondered if these lullabies had been sung to the boys by their mother. The Rosenbergs didn’t seem so different from my own parents. They were Communists, they were from New York, they were Jewish, they were intellectually and artistically inclined. They had been accused of spying for the Soviet Union, which was said about all of our parents. I had many close friends with relatives who had lost their jobs, been blacklisted, were in jail or underground for being Communists. Some years later the government attempted to deport my own father back to what was then the Soviet Union. Alone in the house the night the Rosenbergs were put to death left me with a critical quandary. They were to be electrocuted, and local lore had it that when there was an execution in Sing Sing, the lights dimmed in Croton. My dilemma was whether to turn on all the lights in the house so our electricity wouldn’t contribute to their killing, or turn off the lights so I wouldn’t be aware of the actual moment of their death. I hit upon a compromise. Turning on all the lights, I got into bed and pulled the covers over my head so that I was in total darkness. I wanted to banish the image of Ethel’s sad eyes, quiet my fears about my parents and, most of all, keep from thinking about those two boys. The next time my mother had a school-night meeting was the occasion of my second kamikaze raid. The night of the Rosenberg killing had definitely upped the ante. Once again I had no plan in mind when I crept down the stairs shortly after she left. I simply climbed up on top of the kitchen table, hiked up my nightgown and squatted right over the place where my mother always ate. I peed as long and hard as I could, the urine spattering my legs and trickling under my feet. All I cared about was saturating the spot where my mother would sit the next morning eating toast from the bread she’d baked with the marmalade she’d made and drinking her beloved coffee. All the while her elbows would be firmly planted in the sticky residue of the puddle I was leaving. When I’d finished, I sprinted back upstairs, rinsed off my legs and feet, and slid into bed feeling both exhilarated and afraid of what might be the consequences of having crossed such a line. The next day my mother didn’t say a word about my nocturnal activity. Once again I couldn’t be sure if she was even aware of what I’d done. I did know, however, that she continued to go out at night and leave me alone. I decided I had no choice but to escalate my efforts. This was the genesis of my ultimate action, my attempt to do something that would make her forever regret not taking my fears seriously. As a child, my mother had suffered from polio; at the age of thirty-six a stroke left her partially paralyzed for six months. As a result, the simple acts of standing and walking were challenges she faced all her life. Despite these limitations, or perhaps because of them, she craved speed and freedom. Her natural element was water; she swam like the Pisces she was: a sea nymph with long limbs slicing through the water, black hair fanning behind her. In the absence of water, her choice of locomotion was the automobile. She loved to drive and drove like a pro: fast and fearless. Having her kill me by running me over would be perfect. It was spring when I started rehearsing. Peepers, the baby frogs in the swamp, created a high-pitched din in the late afternoon at just about the time my mother would be arriving. My plan seemed foolproof. I knew almost to the minute when she would be returning from work. Ours was the fourth house on the left just below the crest of a hill. A blind spot there would render me invisible and she’d be upon me before she realized anything was on the road. I’d be lying out in front of the driveway covered by a blanket that blended in with the color of the road. I’d chosen my cover carefully; it was old, moth-eaten, rough and mud-colored, so that when the plan was successfully carried out, my mother’s sorrow would not be diluted by resentment that I had ruined a good blanket. At this point on the rise she’d be distracted because it was where she always executed a tricky maneuver, a very tight 180-degree turn so that the nose of the car was practically in the woods opposite us. From there she backed into the driveway. Nobody ever did that. They simply turned into the driveway and parked. When it was time to leave, they had to back out awkwardly, turn the car around on the steep hill of a narrow road and hope that nobody would be coming along in the opposite direction, hit the blind spot on the rise and plow into them. The swamp at the bottom of the road, four houses below, meant that traffic would be light. I could be pretty confident that any oncoming car at the right time would be hers. At the time I estimated she would be making the left turn off Mt. Airy Hill, known locally as the hill of Reds and Jews, I’d run out of the house, throw myself down in the middle of the road, and pull the blanket over me. Pressing myself as flat as I could, I’d mash the side of my face, my chest, and the parentheses of my childish hipbones into the macadam. There I would wait, breath held, pulse drumming in my ears in syncopation with the frantic calling of the peepers. In a while I’d sense the vibrations and hear a soft droning that got louder as the car got closer. All was in place. I could never go through with it. No matter how hard I tried, how intense my determination, how severely I remonstrated, belittled, and berated myself for being such a coward, in the end I always chickened out. Just before the car crested the hill, I’d jump up like a flapping bird with the blanket draped across my shoulders and make a run for the house. As my mother swooped the car into the driveway, I’d hide the blanket, smooth my braids, brush any debris off my face and slink out to meet her. She’d gather her things and swing her long legs out from below the steering wheel. “Hello Little Flower,” she’d greet me. I’d give her my hand and help her out, and she’d brush a kiss across my cheek. Then she’d bury her nose in my hair and inhale. Nora was born in Manhattan, raised in Croton-on-Hudson, N.Y., went to high school on the south side of Chicago, university at UC Berkeley and has three MAs from various graduate schools in the New York area. She’s worked as a journalist, editor and translator for various publications in N.Y., as a lexicographer on Simon and Schuster’s bilingual English/Spanish, Spanish/English “International Dictionary,” and as an editor of the feminist magazine “Up From Under.” Letters, poems and journal entries of hers are included in the anthology “Venceremos Brigade” (published by Simon and Schuster) about a group of U.S. volunteers who defied the travel embargo and went to Cuba to cut sugar cane in support of the Cuban revolution. 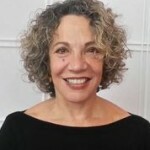 While living in Puerto Rico, Nora was a journalist on the San Juan Star, and taught English and American Literature at the University of Puerto Rico, and served as an editor of the feminist periodical “el tacon de la chancleta.” For 26 years Nora was a teacher and administrator of bilingual programs in the NYC Department of Education and an adjunct instructor of English at SUNY Fashion Institute of Technology. She’s completing a book about being the child of well-known Communist activists in a small, politically conservative New York State community during the McCarthy era of the 1950s. This entry was posted on Monday, September 30th, 2013 at 12:10 pm	and is filed under Essays. You can follow any responses to this entry through the RSS 2.0 feed.